I haven’t posted since I got home from Charleston. It’s been a week now since I returned. Honestly I haven’t done much of anything. I am having a much harder time with this stage than I expected. It helps me greatly to look back on photos of myself as a happy, bright eyed woman because right now I am not sure where that chick is. I have only really gotten dressed once in the past week and that was because some friends came over to celebrate Memorial Day. I barely got off the couch that day and every day since. So…let’s break it down so I can process all that I’m feeling. 1- I hate meds. It’s good I don’t need them on a regular basis because my body freaking hates meds. I had to quit taking the dilaudid because even zofran wasn’t taking care of my nausea. I decided I could deal with a bit more pain if it meant less nausea. 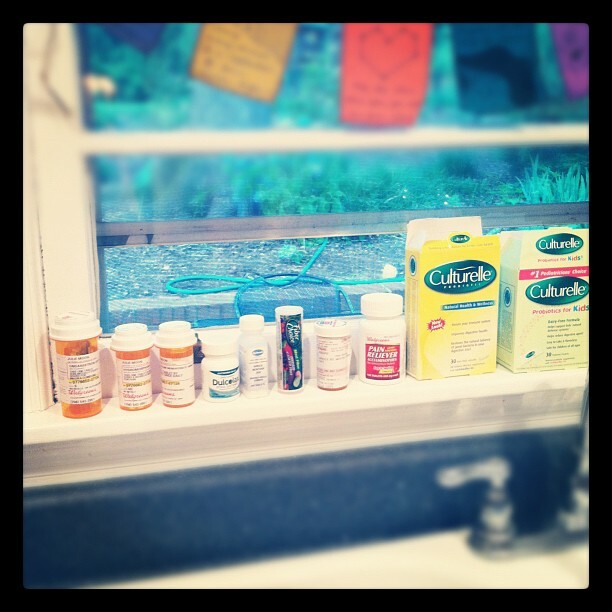 I hate how meds mess with your digestion. I hate that I have to set a timer to remember to take something around the clock. I’m finished with my antibiotic. I’m taking extra strength tylenol but last night I tried some Aleve to see if that helped more. Medicine makes me feel weak…not myself. 2- I feel guilty. Summer started on May 16th for my children. I feel like they are just missing out on the first month of summer, stuck with their sick mom in the house or pawned off on other people. I want to take them to the pool but I can’t get in the pool…which poses a problem when it’s 95 degrees outside and when you have a three year old. A few people have taken the kids to the pool and I feel like I’m missing out. I want them to remember this summer as a fun time not as the summer their mother was laid up on the couch. I’m tired of hearing the tv blaring but little children don’t find things to do on their own easily without some encouragement. I just feel like I’m in a fog and the days are slipping by. 3-I’m scared. I see my wounds and worry about my healing. In my head I know things are going to go fine but it’s such a delicate thing. I pray every day that my body will be whole and complete and healthy but I am scared. 4- I’m worried. I worry about my brca sisters. I know so many of them have been looking to me as a strong example. They have told me their concerns and fears and I have been the champion cheerleader. I have encouraged them and been their support and now I’m weak and I worry that this might scare them. I know they want to know the good and bad but I know how scary it can be also. 5- I’m grateful. My friends have not missed a beat helping me out this time as well. Stopping by with food, to clean up my living room or do a load of laundry. I’ve had plenty of help with my children. Last night one of my friends came and got my oldest two children. She took my wild and crazy 7 year old boy and my 9 year old with a low grade fever who had thrown up the night before. She has three of her own. Her selflessness made me cry. To take a friend’s children when one of them is sick…potentially taking that on for your own family…loving my children as her own was remarkable. I have said it before…my village is amazing. Today my sister came and got the little one and they are off for a day long adventure. I want my babies close to me…they make me feel comforted even when they are driving me crazy. To be alone is a bit scary sometimes but I think I need this day to process, let it all out and stand back up. I know my kids are having the time of their life…they will come home happy, recharged, well fed and loved and hopefully I will greet them with a bit of the same. How I look has become secondary this week…how I feel is so much more important right now. I need to feel better. I’m planning on going out today…somewhere. I’m going to get out of the house and go somewhere that makes me feel normal.